Using a little extra pie crust from the chicken pot pies I made mini apple pies. I recently found these little dishes at IKEA. They measure only 3 1/2 inches across and are about one inch deep. I made them the way my mom made apple pie. . . except I used only one granny smith apple, a tablespoon of cinnamon sugar, a tablespoon of brown sugar, a little bit of butter and a cube of sandwich bread for each dish. Using the left over pastry, I cut 8 circles using Williams Sonoma set of eleven decorative cutters. I chose one slightly larger than the dish. Placed one in each of the four dishes and put a little of the brown sugar in the bottom of each. Then divided the apple mixture and placed a cube of bread and a tiny bit of butter on each and placed the pastry on top. Using the tines of a fork, I crimped the edges, cut three slits in each and brushed with egg wash, sprinkled a little pink sea salt and baked for about 15 minutes. Making only four individual small servings allows me indulge in one of my favorite fall treats...without any guilt. And with no leftovers, I won't be tempted to have another piece with my coffee in the morning. omg this looks so much better than 2 olives and a bud select. you're killing me annie. and how cute are those little dishes? I love the individual little dishes, they look very smart. What a great trick for portion control. These dishes are adorable Annie and they'd be so useful for olives wouldn't they Janet? I need to eat one of these right now. Only one apple??? Amazing. Are you kidding me!? I love this idea, these look so yummy and just the right size. Your kids are so lucky to have you as their mom. Wow Annie. Your a genuine chef and a amazing decorator! Love it! What a cute idea! Looks good. Again - I'm loving the individual servings - but pie for breakfast is one of my favorites! What delicious looking pies! We really do like pies, something which is rarely seen in Hungary but is a staple when we are in England. 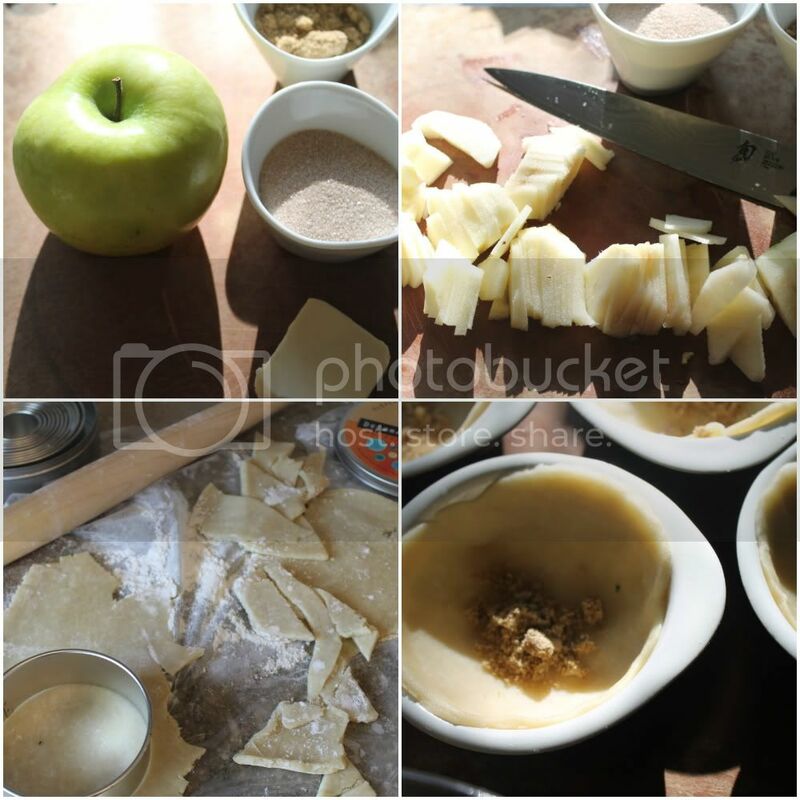 Your individual Apple pies look absolutely wonderful in their own very stylish dishes. Perfect! oh my~ this is making me drool! What a great idea! This looks like something I could really do during naptime, too, or even with the kids. Beautiful pictures. I want the pot pie and apple pie in the same meal! You're making me very hungry!!! It looks delicious! I like the idea of small sizes, I wish I had more time for cook! But I always choose to sew if I have sometime. Have a nice weekend! This is so yummy looking and a ton more appetizing than large pies!